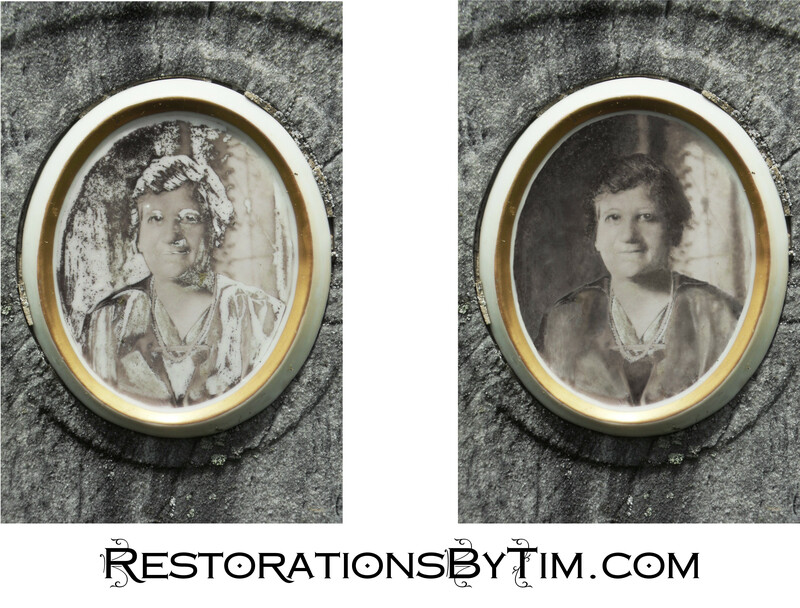 Major Restoration: Weathered Ceramic | Photo Restorations by Tim G.
This ceramic photograph was affixed to a gravestone, presumably upon the death of the woman in 1924, and left open to the elements for decades. These are often the only photos of some people that survive, so restoration attempts are in order. I took a close-up photo of it with a handheld digital camera. The most difficult part for me was the dress, believe it or not, and I haven’t yet made any changes to the necklace. I might try some further experiments on it, but I am proud of the result, overall. It was another 10+ hour job. I’d like to attempt a restoration like this for you, although your mileage may vary.